Shirley is comforted by news that George can stay with her until Darren is tracked down - but his presence at the Mitchells serves as a painful reminder of Heather. Patrick finds the remains of the burnt hoody and phones the police. The police search Dot’s house looking for Andrew’s hoody, but don’t find it. 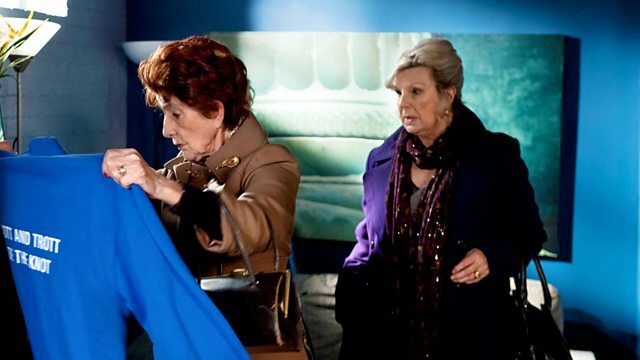 Rose’s angry when she realises Dot’s not convinced Andrew’s innocent. Stealing Billy’s keys, Dot Cora and Rose break into R&R. They find Andrew’s hoody in his locker just as Billy walks in with the police. Ian attempts to talk to Ben, but he’s not interested. Roxy discovers her coat’s been washed, Ben denies any involvement. Phil looks after a grief-stricken Shirley. Roxy and Alfie dismiss Jean’s claim that she saw Andrew outside the station at the time Heather was murdered. Billy’s proud to be in the newspaper. George is returned to Shirley and his presence makes Jay and Ben uncomfortable. DS Crisp requests a sample hoody from Syed’s stall to match with the burnt one. Phil overhears Crisp say he wants to talk to everyone from the stag do. Shirley ignores Ben’s offer of help and sends Jay out to get things for George. Phil hunts for Jay. Phil hears Jean tell Billy Andrew’s innocent. Questioning Jean, Phil makes her doubt what she saw and whether she’d be taken seriously. Jay’s dismayed to learn even Abi’s convinced Andrew’s guilty. She tells him a saying ‘evil only happens because good men do nothing’. Crisp visits Jay and asks to see his hoody. Ben nearly confesses to Roxy but is stopped by Phil. Bursting into the kitchen, Phil hands Jay a hoody and Jay tells Crisp it’s his. When Crisp’s gone, Phil reveals it’s Billy’s hoody. Jay worries for Billy and Andrew. He goes to the police station and, outside, phones Abi, telling her he now understands what she said about good men. Ian gets carried away while helping Bobby with his family tree homework.